It’s your job to find and hire the best candidates for your business, but before these candidates are onboarded they must pass a background screening. 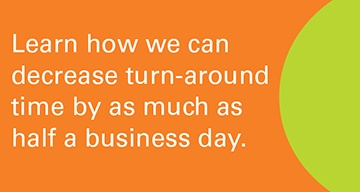 The process a candidate goes through and their experience during a background screen says as much about your business as the welcome they get their first day on the job. A candidate’s experience is their perception of and how they rate interactions during the hiring process, including the application, screening and interview process. A positive or negative candidate experience can impact their willingness to continue the process and their motivation to leave their current job. With the current unemployment rate in the U.S. at 3.9%, we are in a candidate driven job market. In a competitive job market, a candidate’s experience in the hiring and screening process is an important consideration. According to CareerArc, who surveyed 1200 candidates and HR professionals, 72% of respondents said that they would share a bad candidate experience either online or directly. Candidates that experience an overly long hiring process or that don’t feel that their time has been respected are likely to withdraw from consideration. However, those with a positive candidate experience are more likely to accept a job offer, reapply in the future or refer others to the company. To support a positive candidate experience through the screening process, Orange Tree Employment Screening provides CandidateConnectTM, an innovative online and mobile-friendly background screening solution. Offering time savings of up to half a day in the hiring process, it provides timely alerts and ETAs keeps the candidate informed through every step of the screening process. This helps keep them engaged and proactively involved, reducing recruiter time spent responding to questions or requests for updates. With an average of 23 days from job posting to hiring, every hour that can be saved in the hiring process can help you fill that position with a qualified candidate. These days everyone’s mobile phone is either in their hand or less than four feet away. People are searching for jobs on their phones, just as they’ve come to rely on them for the news or to check their email. Taking this reliance on mobile into consideration, Orange Tree found a way to streamline the screening process and make it mobile-friendly to meet the expectations of today’s job seekers. CandidateConnectTM offers branding features that can showcase your brand and help the candidate feel like part of the team. Presenting your brand consistently throughout the hiring process creates a streamlined experience for the candidate. By adding your brand elements to the screening tool, you present a professional and organized front to prospective employees, earning their trust and respect. 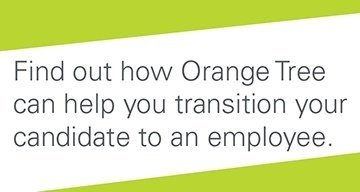 Orange Tree is committed to providing a smooth and fast screening experience for your prospective employees. We know that treating candidates with respect is essential to maintain our customers’ reputation and the goodwill that has been cultivated throughout the hiring process. CandidateConnectTM is an extension of that commitment. Creating the best possible experience for prospective candidates will help you attract top talent and keep them engaged through the hiring process. To learn more about appealing to top performing candidates, check out Recruitment Is A Two-Way Street: Offer The Best Screening Experience For Candidates, Recruiters And Your Bottom Line.